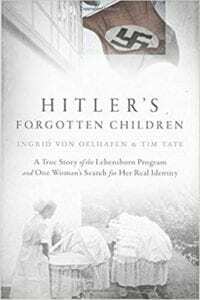 The Nazi program called Lebensborn was designed to mix "racially pure" Aryans with the populations of Europe during the hideousness of Adolph Hitler's rule in Germany. This project was the product of Heinrich Himmler's disgusting imagination, and it provided a number of services, all of which were intended to bring new Nazis into the world. The Lebensborn Project would provide maternity and other services to the SS. It recruited young unmarried women to bear the children of Aryan men, many of them SS officers, provided of course that both mother and father met the racial criteria (blonde and blue-eyed). These women were kept in a home to meet the men and breed the Aryan children who would grow up in Hitler's 1000-year Reich. Lebensborn also ran a network of orphanages for "racially pure" children, including those born of women in the occupied nations who had relationships with Germanic men, a practice that was officially encouraged by Himmler. And it may have been the organization that cared for the thousands of children whom the Nazis kidnapped in occupied nations and relocated to Germany to be raised as Germans. This dark chapter in the history of the Nazi movement is the background for this new novel, which tells the story of a young French woman taken into the program against her will. In the summer of 1941, a force of SS officers under the command of the demonic Major Reinhardt Hurst take over a small French village. Antoinette Gauthier, daughter of the mayor, is a member of the French Resistance but her home is taken over by the Major and his officers. Antoinette is treated by the Germans as a servant and eventually she is seduced by Hurst and goes along with his advances to learn information for her friends in the Resistance. When she becomes pregnant with the Major's child, he rejects her and sends her off to a Lebensborn Home to have the baby. Next door to the Home is an SS Party House where she works in the kitchen and discovers a wounded British pilot hiding in the woods behind the house. Antoinette is commanded to join one of the parties and she agrees in the hopes that she can rescue the pilot and they can escape. The research in this book is tremendous and the story is a definite page-turner. There is much murder and mayhem and man's inhumanity to man/woman within this tale of Antoinette Gauthier. It certainly will make readers wonder why the Nazis were in power as long as they were. Quill Says: The author is to be congratulated for her extensive research that brings the story of Antoinette Gauthier to life. Lebensborn is a story that will make readers think about a horrible time in history and be better able to comprehend the atrocities that took place in the name of the 1000-year Reich.